This year marks the centenary of the Russian Revolution. This event has often been reduced to the urban upheaval that gripped Petrograd (St Petersburg) throughout 1917 and which culminated in the Bolsheviks taking power in October. The Soviet Union traced its legitimacy back to this event, and many other aspiring revolutionaries were inspired by it too—some still are to this day. The twentieth century cannot be understood without reference to Petrograd’s Red October because of the twin legacies of Bolshevik October: the foundation of the first socialist state, and the inspiration it provided for other would-be revolutionaries all over the world. The legacies of the revolution, however, extend beyond October. Historians have begun to embed 1917 into the longer period of war, revolution, and civil war of 1914-23; shifting their attention from the events in Petrograd to what happened in the vastness of the Russian empire. What they have discovered is that the revolution was not a singular moment, but a process involving the breakdown of the Romanov Empire and its violent reconstitution as the Soviet Union. As I have previously argued the Revolution is essential for understanding the current shape of Eurasia; the breakdown of the Soviet Union into fifteen successor states in 1991 was intimately linked with this period of imperial breakdown and the mode of the empire’s reconstruction. Finally, the legacies of the Russian revolution included the Soviet experience of World War II. To many participants this conflict seemed like a continuation of what had happened in 1914-23. With one major exception (Galicia), the countries the Soviets annexed behind the curtain of the Hitler-Stalin pact of 1939 were former Romanov possessions that had avoided reincorporation into the Red Empire. These include the eastern parts of Poland, Latvia, Lithuania, and Estonia. Even Finland, which escaped annexation but had to fight for its independence in the Winter War of 1939-40, was an old Tsarist domain which had gained independence in the wake of the revolution. From the Soviet perspective, then, the annexations of 1939-40 were completing the process of re-gathering Romanov lands under the red flag, a process which had begun in 1919 but had been aborted in the west after the disaster of the Bolshevik-Polish War of 1920-21. Stalin’s enemies also remembered this past. Historians have persistently stressed that the German attack on the Soviet Union in WWII was insane — a campaign against a huge country with poor roads, bad weather, and far superior resources. From the very start, the Soviets had more guns, more planes, more tanks, more men, and more horses; they had space to retreat to rob the German war machine of its tactical superiority, and they had the industrial might to out-produce Germany in a war of attrition. However, the Nazis ignored these facts; the Great Terror and the Finnish War were enough to prove to them that the Soviets were weak militarily. Their miscalculation was also due to their WWI memory of 1914-1918 when the Germans had actually won due to the breakdown of the Russian state and the withering away of its army. Keen students of history, many German military men believed they could reproduce this victory and watch the entire rotten structure tumble down. 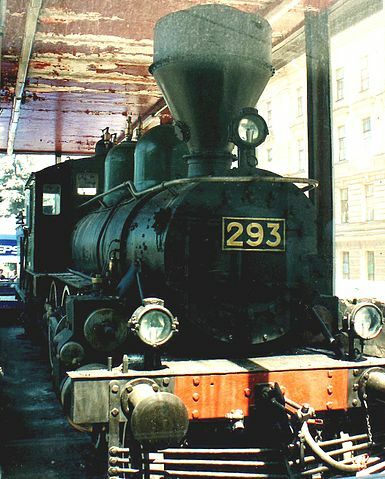 Hk1 #293 at Finlyandsky Rail Terminal, St. Petersburg, Russia. © by James G. Howes, 1998 via Wikimedia Commons. They did not appreciate that the Soviets, too, continued to remember this history and had prepared against its repeat. Stalin’s revolution from above of 1928-32 and his Great Terror of 1937-38 were brutal ways to deal with the trauma of imperial breakdown. The peasants were forced into collective farms to keep them from withholding grain from the cities, as they had done in World War I. Industry had to be developed at an accelerated pace to catch up with the capitalist countries and not face the situation of relative backwardness of 1914. Enemies within, real and imagined, were incarcerated, deported, or shot in order to prevent a repeat of the spectacle of mutiny and uprising. What the Germans faced in 1941, then, was no rotten structure, but a ruthless warfare state ruled by hard-headed authoritarians who would do whatever was necessary to win this war. There was no organized opposition that could rise; the majority of the population was preoccupied with survival; and there was an organized core of highly dedicated fighters for Soviet socialism who would lead the country to victory. The Germans, prepared to fight the previous war, soon learned what mistakes they had made. Meanwhile, ordinary Soviets also remembered war and revolution. Few believed the horror stories of Soviet propaganda. They had seen these Germans before, during their occupation of Ukraine in 1918, and they knew Soviet media rarely told the truth. Many remembered the German occupiers as harsh task-masters but no worse than the Soviets. Most tragically, even Jews sometimes reasoned thus when deciding against the unpredictable life of the refugee. These were the wrong lessons to learn, but they did not seem unreasonable in 1941. Occupiers come and go; you cannot predict who will win; hunker down and look after your family; maybe you shall survive. Those Soviets who went further and collaborated with the Germans also had the events surrounding the Russian Revolution on their mind. Men like Andrey Vlasov or Stepan Bandera did not think of themselves as traitors to their fatherland or as collaborators with the enemy. Instead, they understood what they were doing as a temporary, tactical alliance in order to free the fatherland from the Bolsheviks — a continuation of the Civil War after the Russian Revolution. Then, after all, cooperation with Germany was widespread. The Germans brought Bolshevik leaders in a sealed train to Petrograd, so they could start a revolution; they trained Finnish soldiers who returned home to win their own civil war against “the Reds”; they threw the victorious Bolshevik troops out of Ukraine, after the newly independent state had signed a separate peace; the list could go on. Why not use the Germans in a temporary alliance again? They had left the last time around; they would leave again. The local winners meanwhile would take the spoils, as they had before. That such lessons of history were poor, catastrophic guides to action in the new context was another matter altogether: that they were part of the calculation of actors at the time is beyond doubt. The ghosts of the Russian Revolution went to war again two decades later. Featured image credit: Petrograd (Saint Petersburg), July 4, 1917. Street demonstration on Nevsky Prospekt just after troops of the Provisional Government have opened fire with machine guns. Photo by Viktor Bulla. Public Domain via Wikimedia Commons. Mark Edele is Hansen Chair in History at the University of Melbourne. 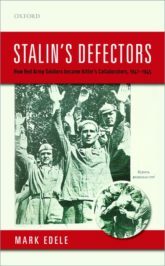 He is the author of Stalin's Defectors: How Red Army Soldiers became Hitler's Collaborators, 1941-1945. For other publications and links to public events, visit his website. My understanding is that the “racial” bias against what the Nazis called “Slavs” is also strongly responsible. I read somewhere the Germans were acclaimed when entering Kiev. Not surprising less than 10 years after Holodomor. It changed quickly, though, through gratuitous Nazi violence. Had they managed their relations with the occupied territories differently, the outcome of the war in the East could have been changed.